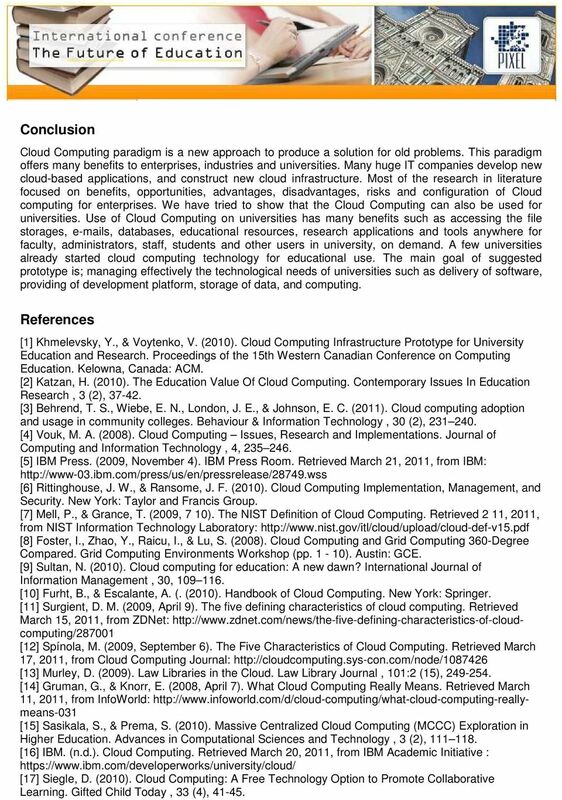 Download "Cloud Computing For Distributed University Campus: A Prototype Suggestion"
1 Cloud Computing For Distributed University Campus: A Prototype Suggestion Mehmet Fatih Erkoç, Serhat Bahadir Kert Yildiz Technical University (Turkey) Abstract In this paper we discuss the Cloud Computing architecture, cloud services, layers and types of cloud and propose a cloud infrastructure prototype for distributed university campus. Cloud Computing can be defined as providing resources and capabilities of Information Technology (e.g., applications, storages, communication, collaboration, infrastructure) via services offered by cloud computing providers. Cloud Computing has various characteristics as shared infrastructure, self-service, pay-peruse model, dynamic and virtualized, elastic and scalable. Nowadays, because of the increasing popularity of Cloud Computing many giant IT companies such as Microsoft, IBM, Google, and Amazon interest developing new cloud environments due to advantages of the Cloud Computing technology include cost, availability, and scalability. A Cloud Computing service has ubiquitous access through a Web browser or mobile device with APIs or special desktop applications developed by cloud service provider. Use of Cloud Computing on universities has many benefits such as accessing the file storages, s, databases, educational resources, research applications and tools anywhere for faculty, administrators, staff, students and other users in university, on demand. Furthermore, cloud computing reduces universities IT complexity and cost. 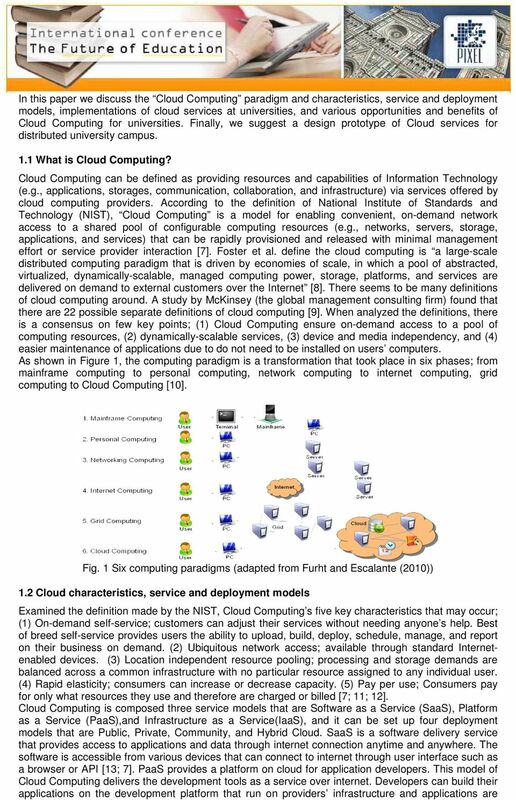 It is argued that cloud computing paradigms and characteristic, service and deployment model of cloud computing technology in first section of this paper. Then we discuss the implementation of cloud services at universities and various opportunities and benefits of cloud services for universities. Finally, we present suggested cloud infrastructure prototype for distributed campus. 1 Introduction Nowadays, Cloud Computing is most discussed term in business and academic environment. Because of the increasing popularity, many giant IT companies such as Microsoft, IBM, Google and Amazon interest Cloud Computing. Cloud Computing refers to the applications, development platforms, and hardware delivered as services over the Internet by cloud providers [1; 2; 3]. Cloud computing is the next natural step in the evolution of on-demand information technology services and products . Many managers in small business and academicians in universities are not aware of benefits and characteristic of minimizing the cost of cloud computing. IT companies are eager to encourage educational adoption of cloud computing; for example, Google has designed cloud based Google- Apps for educational usage , and another example, IBM launched IBM Cloud Academy that is provide a global forum for educators, researchers and IT professionals from education industry to pursue cloud computing initiatives, develop skills and share best practices for reducing operating costs while improving quality and access to education . Some benefits of Cloud Computing can be listed: Reduced implementation and maintenance costs Increased mobility for a global workforce Flexible and scalable infrastructures Quick time to market IT department transformation (focus on innovation vs. Maintenance and implementation) Greening of the data center Increased availability of high-performance applications to small/medium-sized businesses . 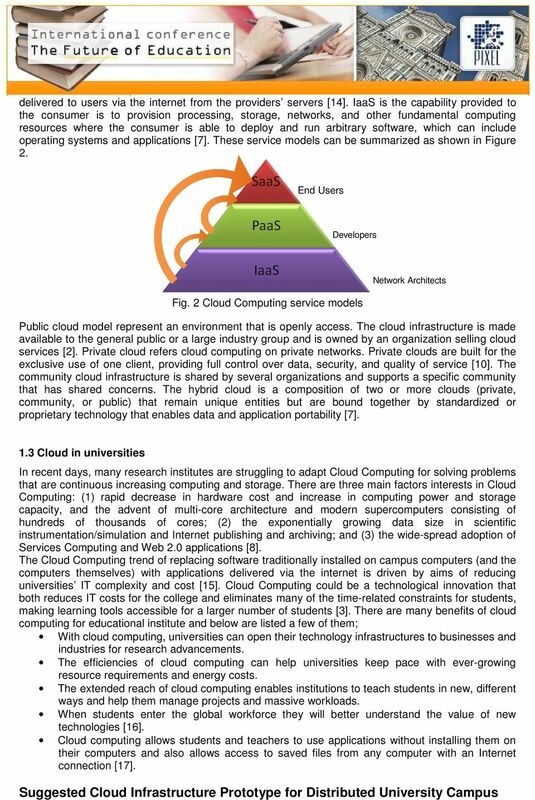 4 In this study, we aim to suggest a Cloud Computing infrastructure scenario to using universities that have distributed campus. Shown as Figure 3, we propose a community cloud occurred computing and storage infrastructure, development platform, and software delivering. Fig. 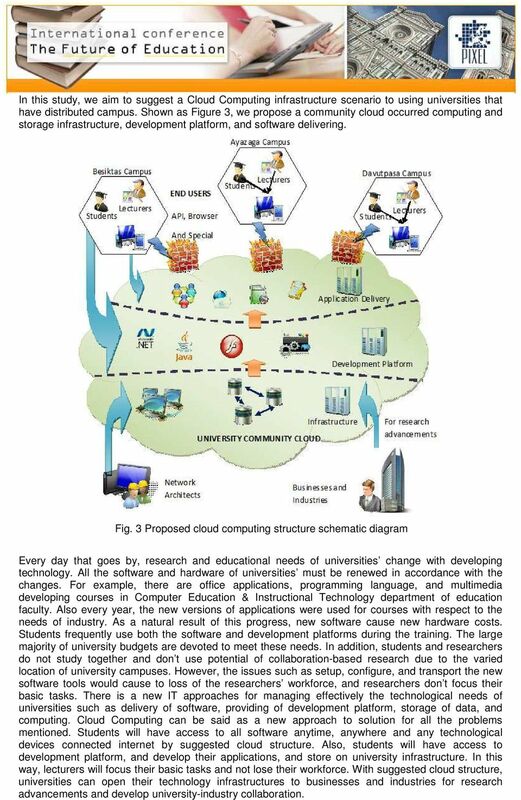 3 Proposed cloud computing structure schematic diagram Every day that goes by, research and educational needs of universities change with developing technology. All the software and hardware of universities must be renewed in accordance with the changes. For example, there are office applications, programming language, and multimedia developing courses in Computer Education & Instructional Technology department of education faculty. Also every year, the new versions of applications were used for courses with respect to the needs of industry. As a natural result of this progress, new software cause new hardware costs. Students frequently use both the software and development platforms during the training. The large majority of university budgets are devoted to meet these needs. In addition, students and researchers do not study together and don t use potential of collaboration-based research due to the varied location of university campuses. However, the issues such as setup, configure, and transport the new software tools would cause to loss of the researchers workforce, and researchers don t focus their basic tasks. There is a new IT approaches for managing effectively the technological needs of universities such as delivery of software, providing of development platform, storage of data, and computing. Cloud Computing can be said as a new approach to solution for all the problems mentioned. Students will have access to all software anytime, anywhere and any technological devices connected internet by suggested cloud structure. Also, students will have access to development platform, and develop their applications, and store on university infrastructure. In this way, lecturers will focus their basic tasks and not lose their workforce. With suggested cloud structure, universities can open their technology infrastructures to businesses and industries for research advancements and develop university-industry collaboration. The Magical Cloud. Lennart Franked. Department for Information and Communicationsystems (ICS), Mid Sweden University, Sundsvall. Cloud Computing. IST 501 Fall 2014. Dongwon Lee, Ph.D.